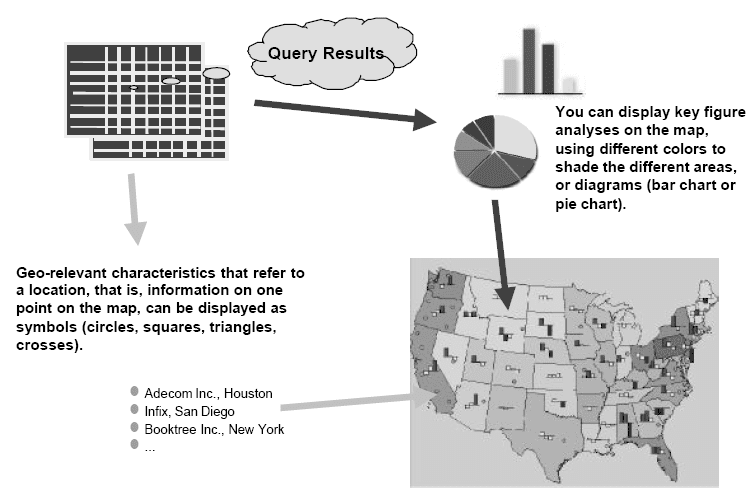 been geocoded for you to use when you are defining queries.Your task is to use these geocoded characteristics to create queries, and design a map that meets your company's requirements. 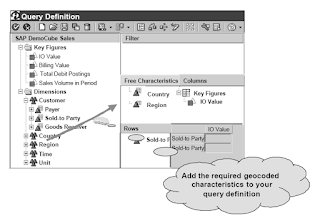 Drag the geocoded characteristics you want to use, into the corresponding lists in the query definition. Add the key figures that you want to display on the map. Save the query, and execute it. 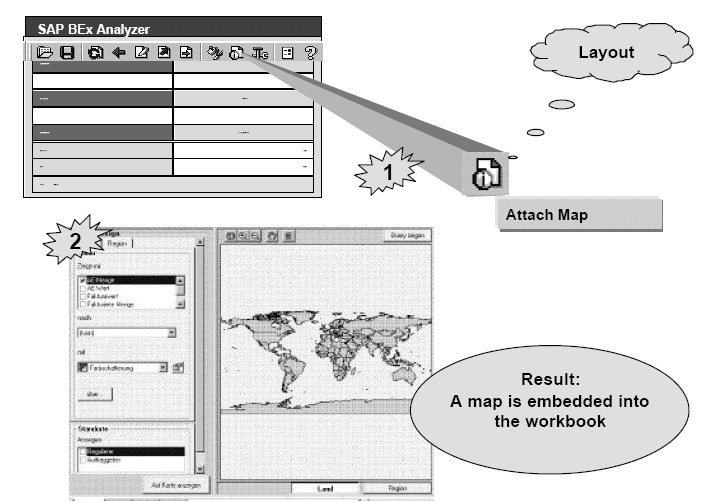 To integrate the map into your workbook, choose Layout -> Attach Map.A map is embedded into the workbook, which you are able to modify as you like. You can color different areas. 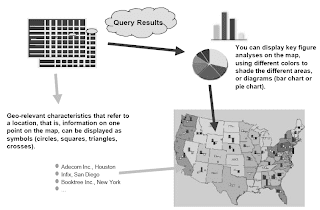 You can insert graphics (bar charts or pie charts). You can display regional location information (on customers, branches, and so on) in the form of circles, triangles, squares and crosses. 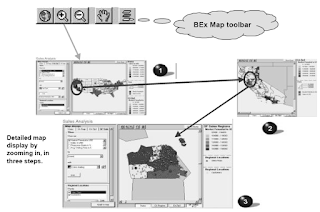 The key figures are displayed on different layers.The number of map layers depends on how detailed the information contained in the InfoObject is.If, in a query, a key figure is used on the country, region, and postal code level, for example, the BEx Map has three layers. 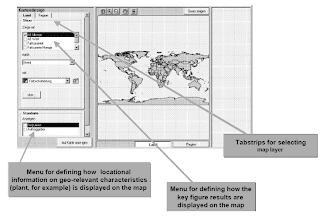 The InfoObjects you use here, must be activated for geographical analysis.When you are designing maps, remember that a larger top layer that is not transparent, will cover any smaller layers below it. 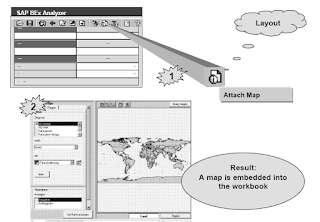 Once you have embedded the map into the workbook, you use the menus on the right of the screen, to specify how you want to display the key figures on the map.Select the tabstrip for the map layer that you want to form the basis of the map view, for example,country or region. (Alternatively, use the relevant pushbuttons under the map to do this). Specify the key figures that you want to display on the map. Specify how you want them to be displayed: In different colors, or in the form of a bar chart or pie chart, which appears on the map,and is assigned to a specific area. If you want dynamic (location-specific) geo-characteristics to be displayed on the map, specify them here, and select a symbol to represent them.Once you have confirmed your selection by clicking on the button, Apply to Map, the results are displayed on the map. On the left of the screen, you see a legend containing all the values that are currently displayed on the map. Choose the Full Extent icon to view the entire map. Choose Zoom Out and Zoom In to see the map in less or more detail respectively. Choose Pan to shift the current view of the map area in any direction, without changing the size or scale. The cursor arrow becomes a hand. Hold down the left mouse button to pan across the map. 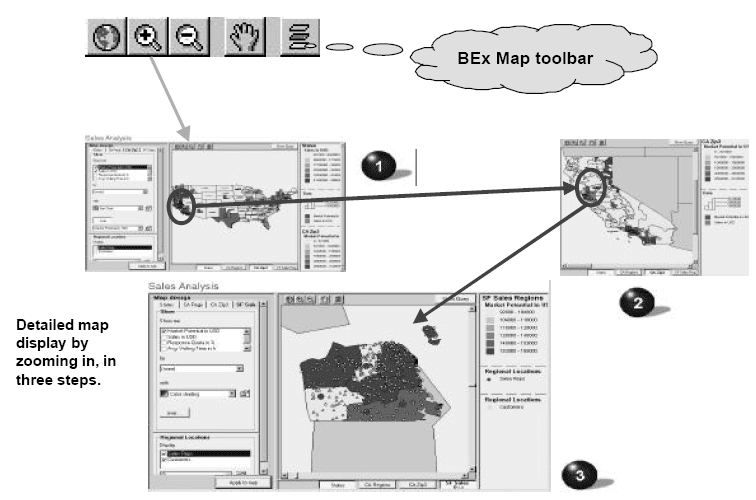  Choose Map Properties (on the right of the BEx Map toolbar) to specify the sequence that the map layers appear in, and their individual properties. In the dialog box Map Properties, you change the sequence that the map layers appear in.Choose either Move Up or Move Down.In the dialog box Layer Properties, you can make settings for each of the layers, including the fill color, fill type, outline color, and outline width. The pushbuttons below the map show you which map layer you are currently working on. The layers from top to bottom are displayed from right to left. Save your map in the workbook.